For a new Zenith watches collector, it’s really important to understand that most people nowadays are not much attracted to huge ornate diamonds/ gold chains. The sophistication and complication behind mechanical movements have earned models like the 03.2081.400/78.C813 Zenith Chronomaster El Primero Full Open watch unceasing demand. Therefore a fine collection for a watch collage of a fresh collector. As one of its own kind, the Zenith El Primero model is made of 42mm stainless steel case and openworked dial. Which features unique luminescent hour markers and hands, along with three vibrant blue, light-grey, and dark-grey sub-dials which are open at the center. Similar to the rest of chronograph Zenith watches, 03.2081.400/78.C813 Zenith Chronomaster El Primero Full Open watch has two reset pushbuttons and a stainless steel winding crown that supports water-resistance of up to 100 meters. For topnotch precision, Zenith watches artisans have installed all of the 03.2081.400/78.C813 versions with 326-component caliber El Primero 400 B. When fully wound, this automatic movement is able to reserve power for 50 hours minimum. While still running at a rate of 10 beats per second to present its wearer with several functions- including Chronograph, Hours & Minutes, small seconds at 9 o’clock, and Date indication at 6 o’clock. Sporty. Worldly. And exquisitely accurate. The ZE0324004046/21C721 Doublematic Zenith Pilot Men Chronograph watch is a novel timepiece under the aviation Zenith watches that has remained deeply connected with numerous globetrotters. Following its notable Second Time Zone displayed on the black and red accents calibrations on the thin ring indicated by a skeletonized red-tipped hand. 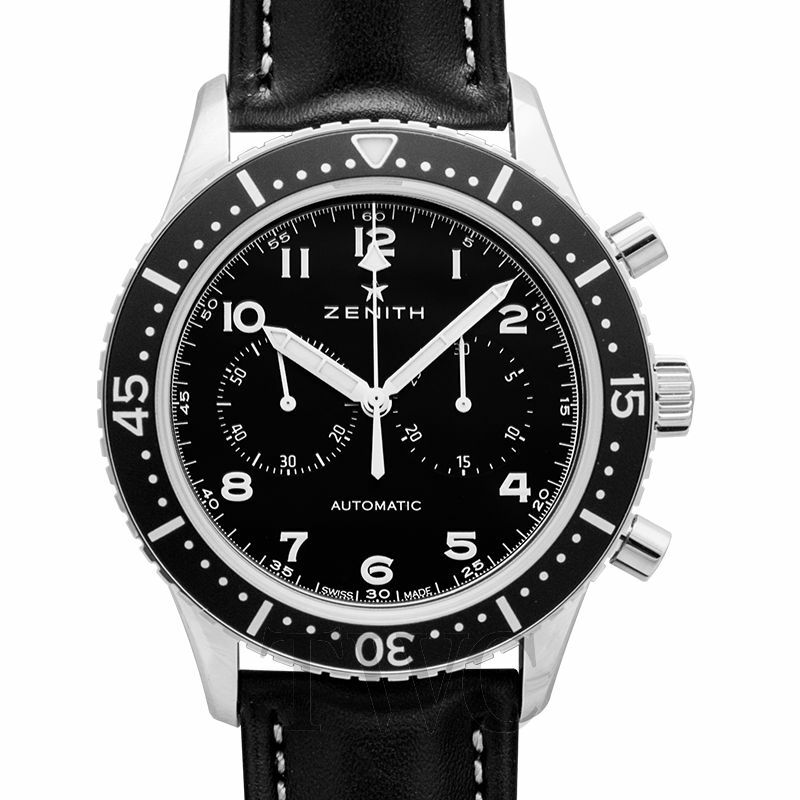 Unlike rest of the Zenith Pilot models, ZE0324004046/21C721 Doublematic Zenith Pilot Men Chronograph watch features a black dial with luminous Arabic numerals. And an alarm function, as well as a power reserve indicator. Typically, let’s just say the Zenith El Primero caliber 4046 that this Zenith pilot uses is ultimately powerful. ‘Cause even after beating at 36, 000 vph, it’s still able to reserve power for 50 hours, provide seconds chronograph, and also double-date functions at the 2 o’clock! As I stated previously, nowadays intricacy in designs is what rates best in watchmaking and also define the creativeness of the maker. 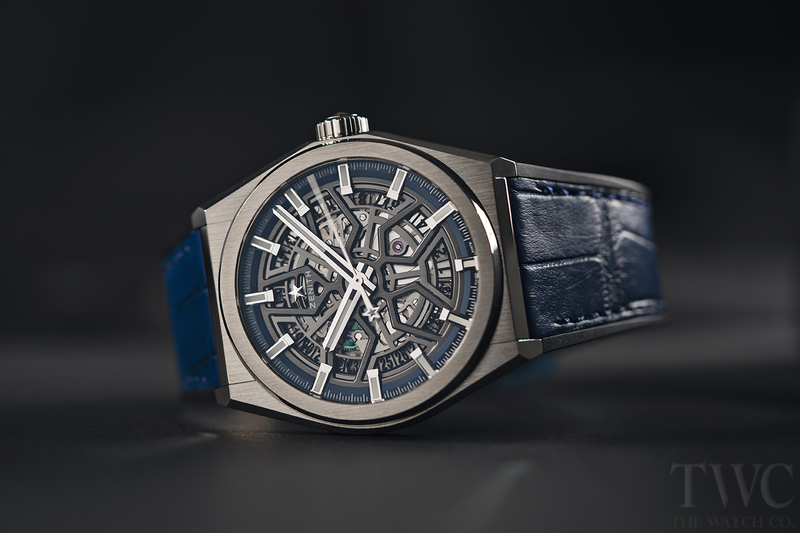 For Zenith watches, the ingenuity used in the Defy collection is exceptionally remarkable and peerless, as with a model like 95.9000.8812/78.M9000 Zenith Defy Zero G.
Unique. Futuristic. And truly reliable. Zenith introduced the Zenith Defy Zero G Titanium watch during Baselworld 2018, and it features an extraordinary design that snares every eye that comes across it. From its 44mm brushed titanium case, the limited edition of Zenith watches holds a skeletonized dial which leaves the hours and minutes decentered at the 12 o’clock. And a naked seconds sub-dial squeezed next to its 9 o’clock marker. That’s not all. To ensure the Zenith Defy Zero G Titanium watch is not affected by gravity, there is an optimized “Gravity Control” module at 6 o’clock. That supports the watch model in countering gravity in order to keep the regulating organ and the balance wheel in a horizontal position. For exquisite functionality, Zenith Defy Zero G Titanium watch has a manually-wound caliber El Primero 8812S movement that beats at a frequency of 36, 000 vph. Despite its extraordinary elegance, this Zenith model is able to reserve power for 50 hours minimum, as well as provide high-precision of time. Modish. Stylish. And excellently accurate. 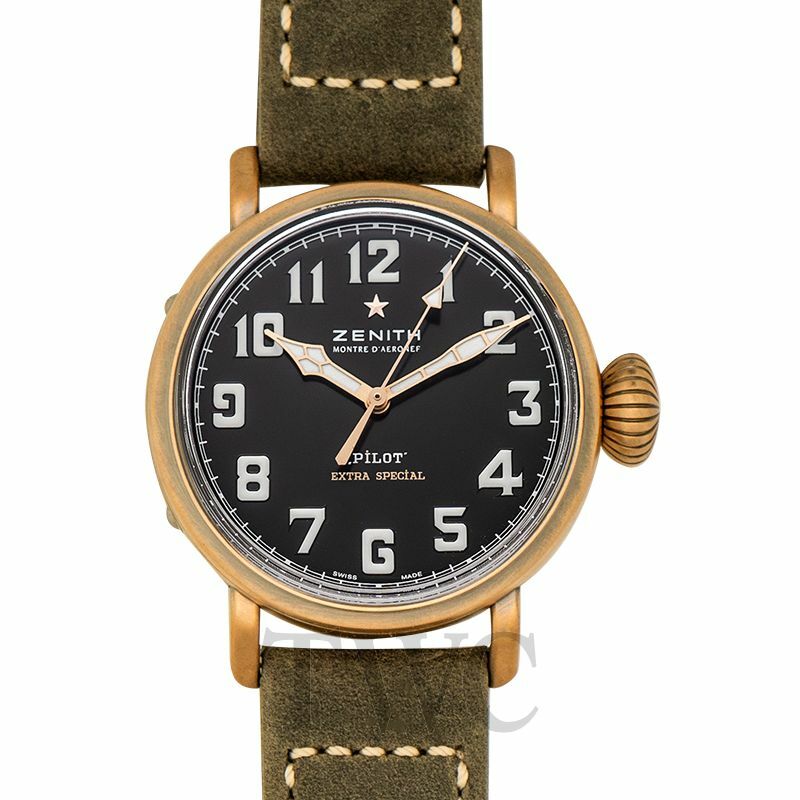 The Zenith Pilot watch is a model that every man who eyes it, pines for it. Though a hard-to-get model, it’s not surprising to find this Zenith pilot selling up to even $ 71, 000 due to its sporty composition. Inside its elliptical 48mm 18k rose gold case, the Type 20 Tourbillon Zenith Pilot watch has an ebony black dial which has been fitted with Arabic numerals and 3 subdials. With the larger one at the 11 o’clock used for tourbillon functions. For optimum precision and efficiency, Zenith equipped the Zenith Pilot watch with caliber El primero 4035 self-winding movement. Allowing the Zenith Pilot model to reserve power for up to 50 hours, whilst offering the precision of Hours, minutes, seconds and even date! For the fans of speed, alongside a blend of both Tradition and modern technology. The Zenith El Primero Original 1969 watch claims the superiority amongst the El Primero chronographs, following its classic aesthetic case-design of the ‘60s and the modest-but-unique chronograph features. Though the traditional silver-toned dial is similar between the two Zenith watches as well. The Switzerland-based watchmaker, however, decided to have it a bit more colorful and with extra splendor. Thereby updating the red center second hand with the Zenith-star trademark, and mixed the three sub-dials with blue, light-grey, and dark-grey colors. 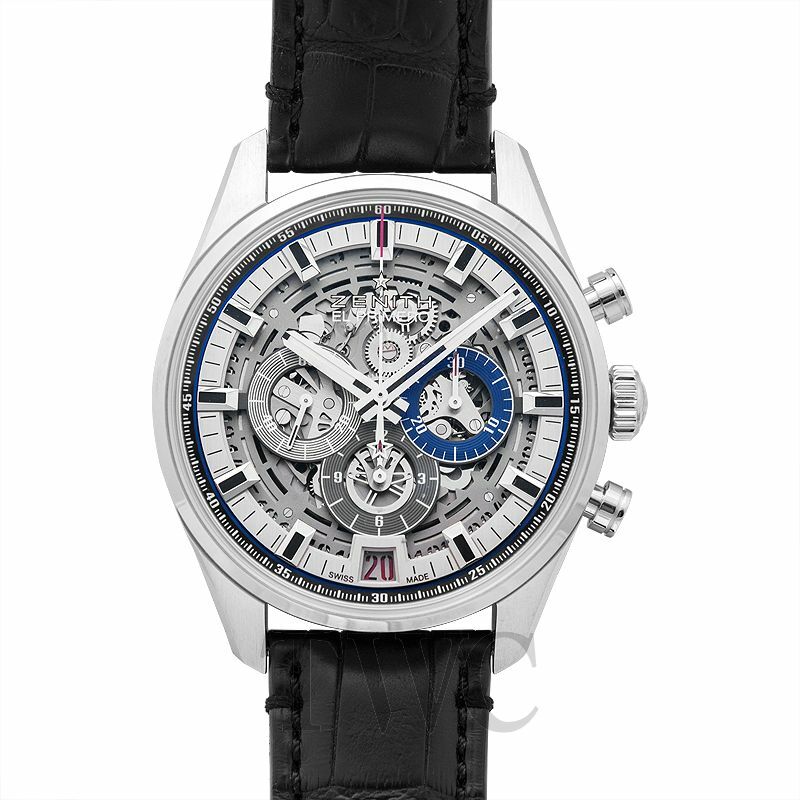 As a high-precision timepiece, Zenith El Primero Original 1969 watch operates with El Primero 400 self-winding movement which is visible through the sapphire crystal caseback. In functionality, the 278-components movement has a frequency of 36, 000 vph, power reserve of 50 hours, and multiple precision functions. Namely, tachymetric scale, Hours & minutes, chronograph, small seconds at 9 o’clock, and date indication at 4:30. As a watchmaker staunchly dedicated to promoting the Swiss Watch Industry, Zenith has been able to instill artistry and innovation within its in-house team. Leading to the creation of iconic Zenith watches like the Elliptical Rose Gold Chronomaster El Primero Open Diamonds watch that’s an admiration of every lady. Since its Rose Gold case and the beige alligator skin strap can match in almost every lifestyle.